Home » Blog » 2018 Bike Camp! Bike Camp is in full swing this summer with just a couple weeks left to ride! Portlanders may have spotted troves of children taking over the streets of Northeast to East Portland, Sellwood, and beyond. They’ve been rolling by friendly neighbors’ houses, checking in at local Parks, and feeding all the goats in our good city. Bike Campers are coping with the extreme Portland heat this summer by seeking refuge under shady trees, chugging ice cold water, and per tradition, enjoying a tricycle-delivered “paleta,” or popsicle. Lime seems to be the most popular flavor this summer; how refreshing! This year we are very grateful to be supported by many in-kind donations from businesses including Fred Meyer, New Seasons, Next Adventure, Clif Bar, and Costco, who have kept our tummies full and our metabolism high for long, hot days in the saddle. We are also gladly avoiding sun burns here at camp because of a generous sunscreen donation from Badger Balm. Portland sun has nothing on our Zinc-laden cheeks! Last but not least, we are happy to stay hydrated all summer long thanks to a generous supply of electrolyte tablets from Nuun. Our camp programs this summer will serve approximately 720 youth, including over 75 campers on scholarships. Youth ride in groups of 10-12 with two trained instructors; this year we are offering 68 separate camps spread over the 11-week summer. We are offering fully funded scholarship camps on-site at four partner locations, as well as including a number of scholarship slots in our home-based camps. Scholarship camp funding is provided by the Juan Young Trust, Nike Community Impact Fund, Metro’s Nature in Neighborhoods program, and the City of Portland’s Bureau of Transportation. 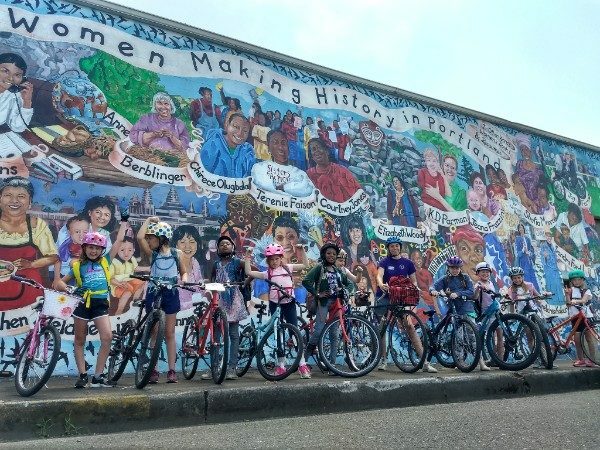 Our camps have had the opportunity to visit several local, cycle-minded businesses and organizations including: Breadwinner and the Vanilla Workshop, Sugar Wheel Works, Ride with GPS, Shemanski Farmers Market, Islabikes, and Whitaker Ponds. We are overly appreciative that these businesses have open arms for our camps and allows us to take a sneak peek into their worlds. Bike Camp believes that by connecting youth to the cycling organizations around us we build community and reinforce excitement for alternative means of transportation. Our campers are walking away from camp at the end of the week with a level up on their cycling skills and knowledge to build on. What is most exciting are the smiles on all the faces as campers roll up at the end of the hot day. We see our campers exploring empowerment and freedom on their little vehicles and get excited to send them back into the world armed with increased self-confidence and mobility. Some campers arrive on Monday morning not quite sure what they’re in for, and other veteran campers show up fully aware of the fun week ahead. Although we are close to reaching maximum capacity for camp this summer, there are still a few available spots for any spontaneous adventurers out there! Contact Bike Camp for more information about how to sign up, and join us for a wheelie fun week cycling!